Gluten free toasted oat clusters made with gluten free oat flakes and rice flour with dried berries, coconut flakes and sunflower and pumpkin seeds. 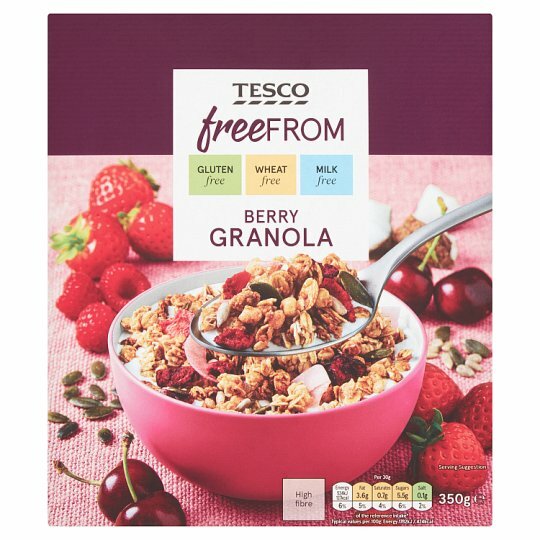 INGREDIENTS: Gluten Free Oat Flakes (56%), Glucose Syrup, Rice Flour, Sunflower Oil, Sugar, Dried Berries (3.0%) [Strawberry, Raspberry, Cherry], Honey, Coconut Flakes (1.5%), Sunflower Seeds (1.5%), Pumpkin Seeds (1.5%), Salt, Antioxidant (Tocopherol-Rich Extract). Contains gluten. Also, may contain peanuts and nuts.. For allergens, see ingredients in bold.